A Gallup survey conducted amid the unrest in Yemen between mid-February and early March 2011 shows 48% of Yemenis said they do not have confidence in their national government, up from 39% in late September and early October 2010. The percentage of Yemenis saying they are confident fell to 37% from 52%, and those without an opinion climbed to 15% from 9% over the same period. Many Yemenis were already staging protests in the capital city of Sana'a in late January before the survey began. Peaceful demonstrations in early February ended in violent clashes between the anti-government protesters and pro-government demonstrators. However, the Republican Guard sniper attack that left at least 45 protesters dead and hundreds wounded was still a few weeks away, as was the defection of Gen. Ali Mohsen al-Ahmar, President Ali Abdullah Saleh's longtime ally. Saleh is now in Saudi Arabia for medical treatment after being wounded in an attack on the presidential compound, and may be on his way back to Yemen imminently. With international leaders pressing him to relinquish power and not return to Yemen, it is at least possible that his nearly 33-year rule is coming to an end. In the wake of these historic events and amid uncertainty, public opinion in Yemen may have shifted again, toward even lower confidence in the government. However, the February-March survey reveals interesting insights into the differences in demographics and attitudes among the government's detractors and supporters. 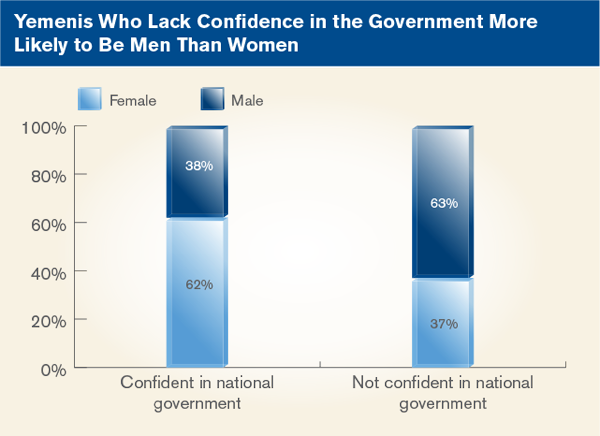 Yemenis who are not confident in their government are significantly more likely to be male (63%) than female (37%). This may be partly attributable to the pressure that men are under to earn a living in Yemen and to provide for their family, which puts them in a position to experience the government's shortcomings most directly. Women in Yemen, for the most part, do not work. Another factor that may contribute to this gender gap is that when asked if they have confidence in the national government or not, more women are likely to not answer the question - 21% of women compared with 10% of men. 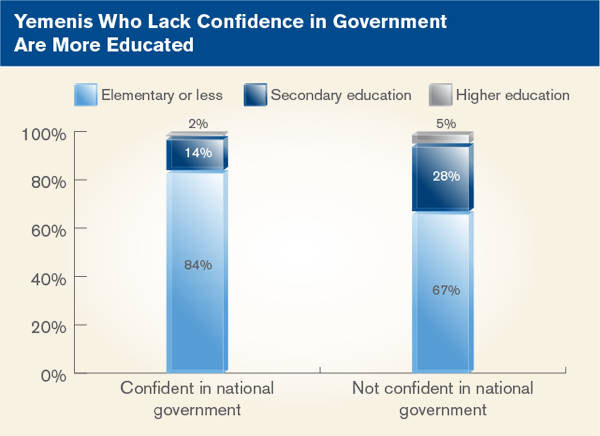 Yemenis who say they do not have confidence in the government tend to have higher levels of education, with 28% having completed secondary education and 5% having completed higher education. Yemenis who say they have confidence in the government are less likely to have higher levels of education: 14% have a secondary education and 2% have completed higher education. 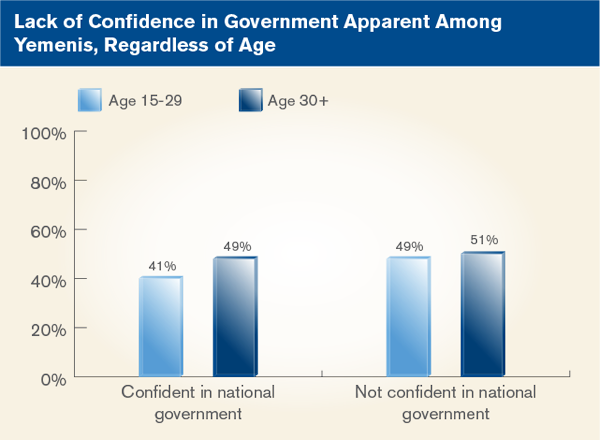 Perhaps surprisingly, given young Yemenis' visibility in the uprising, there is no difference in the age composition of those who are confident in the national government and those who are not. Economic concerns are a primary root of the discontent in Yemen. By some estimates, as much as half of the population lives on less than $2 a day, making Yemen the poorest country in the Middle East. The current political crisis has deepened the country's economic woes, causing banks to cease functioning properly, fuel shortages, and rapidly rising costs for water. Sana'a is in the midst of what some commentators have called an all-out water crisis, and World Bank analysts say the city may become the first world capital ever to run out of water. Yemenis who say they do not have confidence in the government are the most likely to be hit hardest by these economic problems. 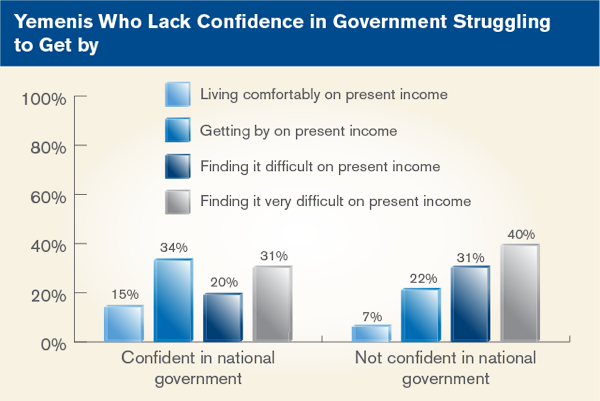 Yemenis who are not confident in the national government are much more likely than those who are confident to say they find it "difficult" or "very difficult" to get by on their current household income. Those with confidence in the national government are more likely to fall into the category of living comfortably on their present income (15%) than are those who lack confidence (7%). Overall, 63% of Yemenis say the economy is getting worse. Those who do not have confidence in the government are particularly likely to say the situation is getting worse: 85% of government detractors say so. Those with confidence in the government are less likely to say so - 37% who hold this view believe the economy is getting worse. Thirty-nine percent of those with confidence in the government say the economy is getting better, compared with 5% of those who lack confidence. 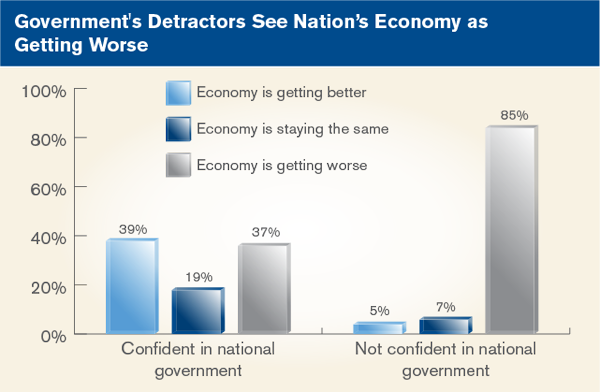 The government's supporters and detractors are less divided in other areas related to the economy. Seventy-five percent of Yemenis agree it is a bad time to find a job in the city or area where they live. This is the prevailing view among those who support the government (70% see the job market as bad) and those who do not (82%). 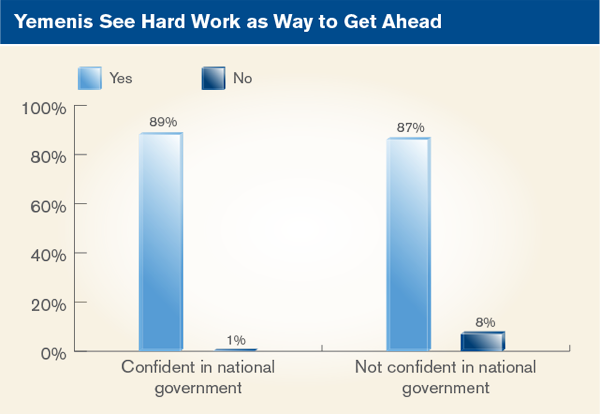 Government supporters and detractors also agree it is possible to get ahead in their country by working hard. While this may be cold comfort when the economy is in shambles, it suggests that Yemenis would be willing to exert the needed effort and rebuild their country when times get better. As in Tunisia and Egypt, where uprisings have already led to regime change, the government in Yemen is widely seen as corrupt. Regular Yemenis suffer while those in power live well, using payoffs to win political support and force to seize control of assets and private property. Saleh has poured vast sums into fending off a challenge from the Ahmar family, his rival in Yemen's complex tribal politics. Many of the members of al Qaeda in the Arabian Peninsula have also come out of Yemen's tribes. A well-organized faction of the terrorist group has made Yemen its home, which has caused governments elsewhere to watch Yemen's growing political turmoil with concern. Meanwhile, dozens of Saleh's family members and tribesmen hold top positions in the military or business. Saleh's plan to install his son Ahmed as his successor has drawn outrage from protesters. Seven in 10 Yemenis see corruption as widespread in their government. A substantial majority of those who have no confidence in the government hold this view (89%) as do a slim majority (54%) of those who do have confidence. One-quarter of those who have confidence in the government could not or would not answer the question. Businesses are also seen as corrupt, though by a slimmer majority of Yemenis (53%). Sixty-seven percent of the government's detractors and 45% of supporters see corruption as widespread in business. 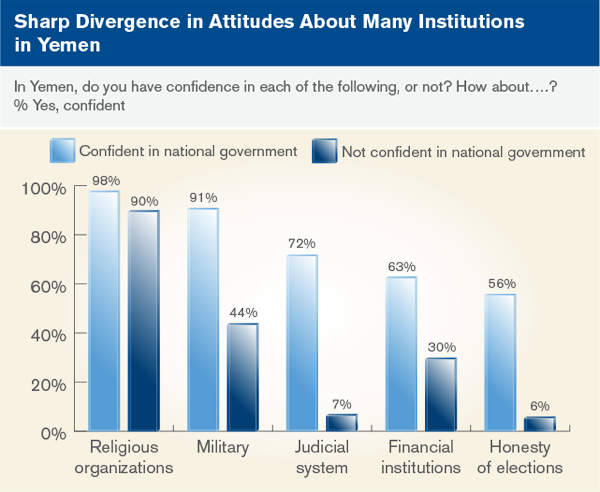 Yemenis are sharply divided in their attitudes toward the nation's institutions. Among those who have confidence in the government generally, nearly all also have confidence in the military (91%). However, this is one of the findings that might be substantially different if the survey were conducted today, with Al-Ahmar's defection and other military-related developments factored in. A majority of the government's supporters also say they have confidence in financial institutions (63%), the judicial system (72%), and the honesty of elections (56%). Confidence in the military and in financial institutions is much lower among the government's detractors (44% and 30%, respectively), and is virtually nonexistent for the judicial system and the honesty of elections. Fewer than 1 in 10 Yemenis who do not have confidence in the government as a whole express confidence in the courts and elections. Religious organizations are the one institution that Yemenis are united on, regardless of their view of the government; 92% of all Yemenis express confidence in them. The people of Yemen have made it clear, through months of anti-government protests and in their public opinion, that they seek dramatic change in their country. The hope that equality will replace advantage based on clan or kinship; that corruption can be eliminated; that the fallow economy will flourish and start producing jobs; and that government institutions will serve the people, instead of a corrupt few who control them, are all evident in what Yemenis have been saying on the streets and in the media. How a new Yemen will be fashioned is yet to be resolved. Gallup is entirely responsible for the management, design, and control of this study. For the past 70 years, Gallup has been committed to the principle that accurately collecting and disseminating the opinions and aspirations of people around the globe is vital to understanding our world. Gallup's mission is to provide information in an objective, reliable, and scientifically grounded manner. Gallup is not associated with any political orientation, party, or advocacy group and does not accept partisan entities as clients. Results are based on face-to-face interviews in Yemen with approximately 1,000 adults in each survey administration, aged 15 and older, during 2009 through 2011. Surveys in 2009 were conducted Feb. 24 - March 19 and Aug. 4 - Sept. 2; in 2010, they were conducted from Feb. 12 - 27 and Sept. 22 - Oct. 2 and in 2011 surveys were conducted Feb. 15 - March 3. For results based on the total sample of adults, one can say with 95% confidence that the maximum margin of sampling error is ±3.9 percentage points. The margin of error reflects the influence of data weighting. In addition to sampling error, question wording and practical difficulties in conducting surveys can introduce error or bias into the findings of public opinion polls. The questionnaire was translated into Arabic. The translation process starts with an English version. A translator who is proficient in the English and Arabic languages translates the survey into the target language. A second translator reviews the language version against the original version and recommends refinements. The Abu Dhabi Gallup Center is a Gallup research hub based in the capital of the United Arab Emirates. It is the product of a partnership between Gallup, the world's leading public opinion research firm, and the Crown Prince Court of Abu Dhabi. Building on Gallup's seminal work in the field of Muslim studies, the Abu Dhabi Gallup Center (ADGC) offers unmatched research on the attitudes and aspirations of Muslims around the world. In addition to its worldwide scope, the ADGC focuses on the specific priorities of its regional base and presents innovative analysis and insights on the most important societal challenges facing the United Arab Emirates and the Gulf Cooperation Council (GCC).